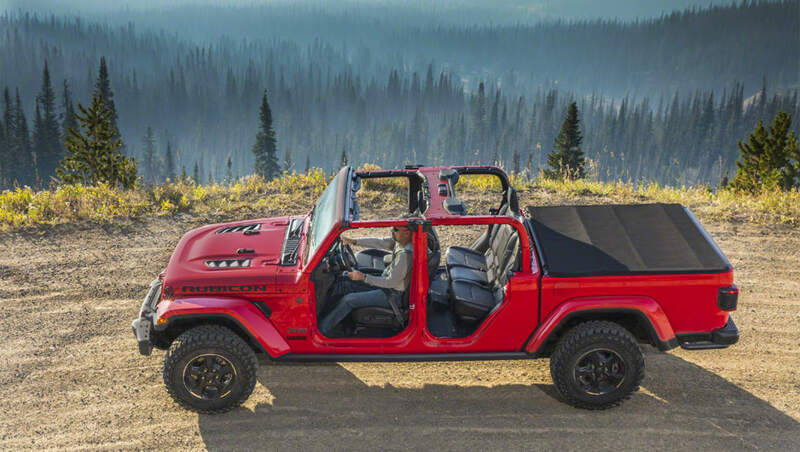 If you think Jeep's Wrangler-based Gladiator ute (or pick-up, in the local parlance) would look (and sound) even better with one of the brand's meaty V8s wedged under its bonnet, we might have some news for you. Those with a thirst for power might have been a touch disappointed to see the Gladiator's engine range top out with a petrol V6, but the word from Jeep's heavyweights is to "watch this space". "I'm going to answer your question with a question; wouldn't that be awesome? Watch this space," said Jeep's head of design, Mark Allen. Now it must be said, that's no kind of guarantee, and Jeep executives wouldn't be drawn on future product plans. But given FCA's glorious propensity for stuffing V8 engines into a wide range of unexpected products (Grand Cherokee Trackhawk anyone), a beefed-up Gladiator would hardly be surprising. It's also possible, though, that he might be referring to a special edition built one-off for Jeep's Easter Safari, like the Hellcat-powered Trailcat Wrangler. For now, though, the Gladiator will arrive in three trim levels - Sport, Sport S, Overland and Rubicon - and will be available with two engine choices, a 3.6-litre petrol V6 good for 209 kW and 353Nm - paired with an eight-speed automatic or six-speed manual - while a 3.0-litre diesel V6 will launch later, scheduled for 2020. "It's not just a Wrangler with a box, it's actually a real truck. It's got real towing, real payload," says Allen. "Usually we get a brief from product planning, but this has been all consumer voices saying; "I want a pick-up, I want a Jeep truck". Would you not be entertained by a V8-powered Gladiator? Tell us in the comments below.